Product #16104 | SKU EF3520ISU | 0.0 (no ratings yet) Thanks for your rating! The lens' ring-type ultrasonic motor (USM), rear focusing system, and high-speed CPU--with optimised AF algorithms--ensure that you experience quick, quiet and precise autofocus action. Its circular eight-bladed diaphragm gives pleasing, soft background effects, and a Glass Moulded (GMo) aspherical lens element minimises aberrations and contributes to higher image quality out to the edges of the frame. Adjust focus using either autofocus (AF), or full-time manual focus, without having to switch modes or change camera settings. Optical Image Stabilisation (IS) gives up to 4 shutter speed stops of compensation against the blur caused by camera shake, providing clearer images when shooting in low light. A micro-stepping drive provides quieter operation and a low speed focus drive delivers optimal results when shooting video. Canon's optical Image Stabilisation provides four stops of effective shutter speed compensation for camera shake, and can detect normal shooting or panning and automatically switch to the optimal IS mode. This means you can shoot in dimmer conditions, capturing images with shutter speeds up to four stops slower than would otherwise be possible. A single Glass Moulded (GMo) aspherical lens element achieves high image quality with improved performance in the edges of the lens. A ring-type USM, high-speed CPU with optimised AF algorithms, and rear-focusing system combine to enable silent and fast autofocusing to help you focus right on the action. 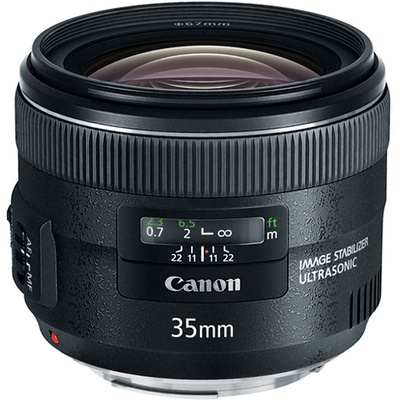 This lens has a minimum focusing distance of 24 cm.